Local traffic is a sore subject of late! We hate to be the bearers of bad news but there’s more to come. 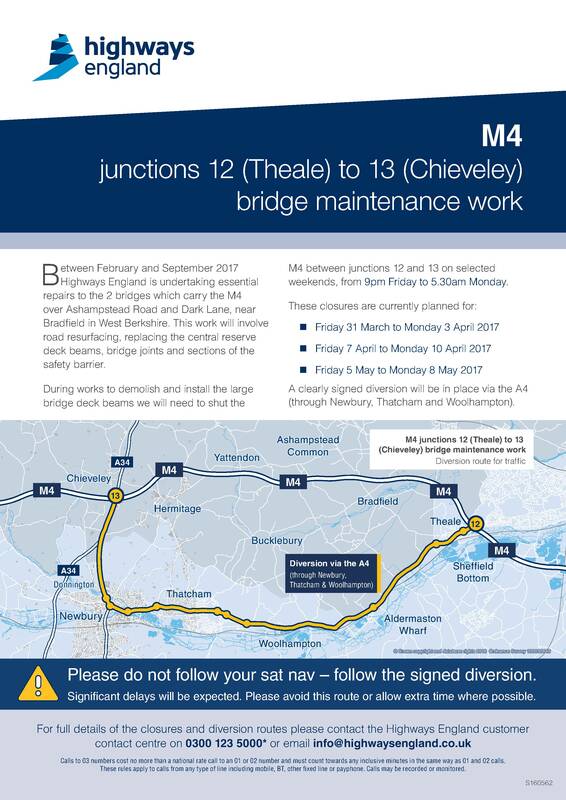 The M4 is set to be closed locally on some weekends in April and May – including the Easter school holiday. All traffic will be diverted through Newbury, Thatcham & Woolhampton. So if you’re planning on driving anywhere on the below dates, be sure to remember the roads will be really, really busy! The advice from Highways England is “please avoid this route or allow extra time where possible”. “Between February and September 2017 Highways England is undertaking essential repairs to the 2 bridges which carry the M4 over Ashampstead Road and Dark Lane, near Bradfield in West Berkshire. This work will involve road resurfacing, replacing the central reserve deck beams, bridge joints and sections of the safety barrier. 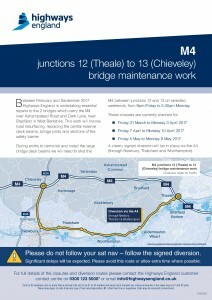 During works to demolish and install the large bridge deck beams Highways England will need to shut the M4 between junctions 12 and 13 on selected weekends, from 9pm Friday to 5.30am Monday. A clearly signed diversion will be in place via the A4 (through Newbury, Thatcham and Woolhampton). Please do not follow your sat nav – follow the signed diversion. Significant delays will be expected. Please avoid this route or allow extra time where possible.